Poconos Mountain Bus Tours and Packages! Day One: Arrive and check into a Pocono Mountain 3 star hotel. Baggage service to each guest room. Tonight's Dinner: might include Country and Western night! Includes Old West cabbage salad, Multi bean salad en vinaigrette, tossed garden greens, Our own Zesty Chili Con Carne, Bar-b-Qued Pork ribs, Bar-b-Qued fresh chicken, fresh corn on the cob, Homemade corn bred, and brownies for dessert. Pitchers of beer and carafe's of wine with dinner. Entertainment might be a comedian/impressionist, magician or local live band. Day Two: Group breakfast buffet, full breakfast menu. 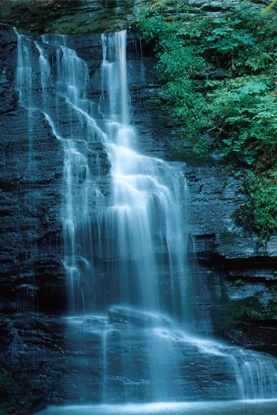 A professional guide can be supplied on board your coach for a day tour of the Poconos. Visit attractions like; the famous Delaware Water Gap where you will depart the coach and get on board the narrated Water Gap Trolley tour. This is an hour or so tour of the Water Gap area, a natural wonder. Along the route the wide points out the historic sites in the village, the Indian settlement area, and homes of famous people such as Fred Waring, and many famous Jazz musicians. Then back on your coach to Bushkill Falls, nestled in the Delaware Water Gap national Park. Group admission to the falls is included. Was as many falls as you like or wander around the beautiful forested ground. 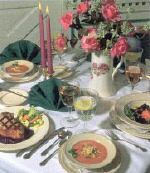 A Picnic lunch for the group at a nature pavilion is provided. Afterwards, join the coach tour of the Poconos for a narrated trip through the back mountains. Visit places like Callie's Candy Kitchen. See candy being made, listen to unique stories of "Callie" a grandfatherly candy maker of over 50 years experience. If time allows you'll visit The American Candle Shop ... a store of one million choices. Return to the hotel at about 4-4:30 or so to relax before dinner. Italian Feast - Huge antipasto salad... prior to the fun event of the Pasa Bar. Your choice of pasta with your choice of sauces and "adds" to the dish entree. garlic bread, Italian Pastries of dessert. Baggage service to coach. We'll sadly see you depart. Days 1 and 2 as described above plus we can arrange additional day/nights to include the likes of:. A box lunch is provided for your enjoyment of the village (art galleries, shops and quaint streets) of Jim Thorpe. Return to Stroudsburg for the afternoon and enjoy our town of shops and galleries. Tonight.... a Murder Mystery. During dinner someone will ge stabbed or shot to DEATH!. The Mystery Theater begins!. Who dunnit????. The show director, will have a ball with his guests, you'll be involved in the mystery,,,,,,maybe ONE OF YOU COMMITTED MURDER!. Day 4 Group Breakfast Buffet, Baggage Service to the Coach. Depart with our sad faces watching you leave!. Camelbeach Waterpark - Exit 299 I-80 (Camelback Road) Tannersville , PA 18372 - Toll-Free: 800-233-8100 Phone: 570-629-1661 | Fax: 570-620-0661 New for 2006, The Flow Rider, the ultimate surfing ride! 22 Water-slides- The most in the region! Featuring Checkered Flag Challenge with Kahuna Lagoon wave pool, two kids play zone, the Blue Nile Adventure. Toy & Nascar Museum - 1 Fenner Ave Sciota , PA 18354 - Phone: 570-402-0243 | Fax: 570-402-7565 Over 14,000 pieces, including more than 7,000 toys, 7,000 NASCAR, 1,500 Dale Earnhardt Sr. items. Something for everyone. World's largest private toy collection of it's kind. Contact A Group Coordinator for tour prices and more information.